Length measurement devices are primarily used to measure and record distance as part of tensile and pressure testing through linear motion. These are highly-durable devices that can convert distance into a measurable output. 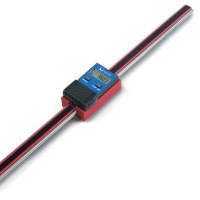 The Measurement Shop offer a selection of high-quality length gauges manufactured by Sauter, that can be used in engineering and manufacturing processes within machinery and industrial equipment monitoring applications. If you require any help choosing a product to suit your requirements please contact us.